We’ve got a surprise for you! “Totentanz”, the short story that Nancy Holder and I wrote for the anthology Danse Macabre, edited by Nancy Kilpatrick, is available for a free for 30 days with permission of our publisher. We hope you enjoy “Totentanz” and consider picking up a copy of Danse Macabre for further reading enjoyment. Download “Totentanz” now. 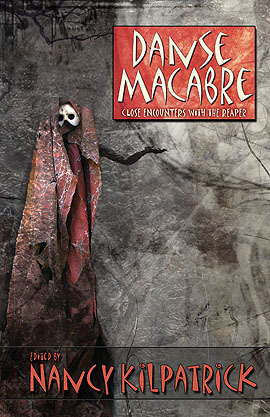 Book Description — Danse Macabre: Close Encounters With the Reaper could be one of the most unusual anthologies you’ll ever read! Twenty-three literary reflections embody the theme, classical artwork devoted to the spectrum of humanity’s intriguing interactions with the Angel of Death in all of his/her manifestations. Buy a copy of Danse Macabre. Story Description — “Totentanz” is the story of a young woman who has moved to Germany during Carnivale season and soon finds herself at odds with her finance while trying to balance a life and death decision at work. This entry was posted in Fiction, Signal Boost, Uncategorized. Bookmark the permalink.